The Raven AccuFlow and Raven AccuFlow Vortex™ systems are integral pieces to the complete anhydrous ammonia (NH3) system. 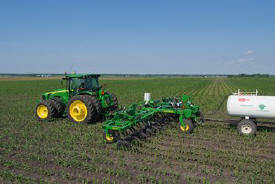 Both systems provide accurate metering to the established John Deere NH3 solution—all available at John Deere. Raven AccuFlow and AccuFlow Vortex are trademarks of Raven Industries Incorporated. Everything needed to fully plumb a single section AccuFlow system is orderable through the John Deere price pages. These complete kits will improve installation and ordering efficiency. It is no longer necessary to work with a third-party supplier to fully install an anhydrous ammonia (NH3) delivery system. AccuFlow Vortex offers machine-specific kits that include all the components needed to operate the nutrient applicator, such as the Vortex cooler, mounting hardware, hoses, and GreenStar™ Rate Controller harnesses. Kits are available for the following platforms. AccuFlow Single Cooler kits are configurable to meet producers’ needs and the size and series of the 2510 Nutrient Applicator it is being installed. Raven AccuFlow™ is a trademark of Raven Industries Incorporated. CDS-John Blue Company name used with permission. Squibb Taylor Incorporated and Flo-Max Coupler name used with permission. 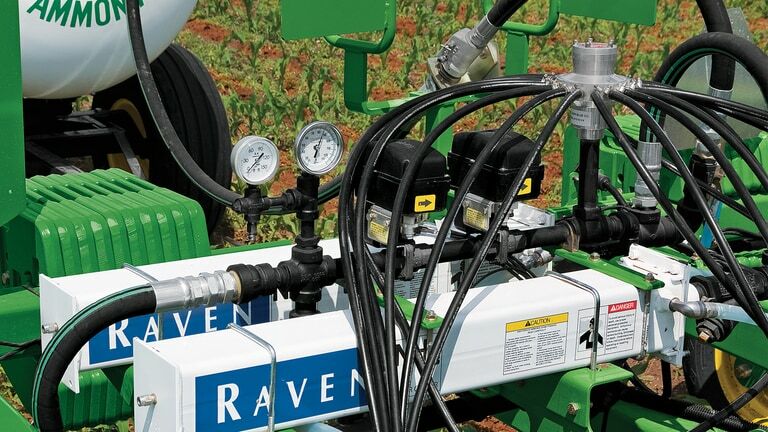 The Raven AccuFlow™ and AccuFlow Vortex™ systems allow accurate metering and application of anhydrous ammonia (NH3). Crops get the exact amount of nitrogen needed for maximum yields, while avoiding over application, enabling producers to control input costs. The price of NH3 fluctuates and is more expensive than it once was. It is important for producers to manage this input cost by controlling the amount applied. 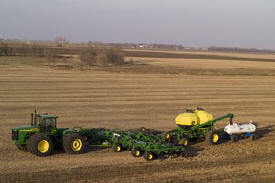 AccuFlow helps to ensure the correct amount of NH3 is applied to reduce over and under application of NH3. Over application of NH3 is a preventable expense, while under application of NH3 decreases crop yields. Anhydrous ammonia (NH3) is maintained in a liquid form by storing it under pressure in a nurse tank. When liquid ammonia is released from the nurse tank, there is pressure loss due to friction of the liquid flowing through the delivery hoses. The reduced pressure and change in temperature allow the liquid to boil and convert a portion of the liquid into gas. The gas decreases the accuracy of the flow meter and rate controller. The Raven AccuFlow™ systems reduce the temperature of the NH3 to ensure it is in a liquid state at the flow meter and can be accurately metered by the rate controller. In addition The Vortex cooler alone delivers 50 gpm (60 percent increased capacity over the current single cooler and 25 percent increase over the current dual cooler system). 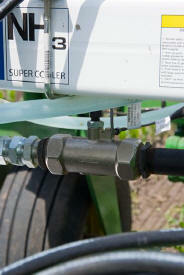 Without AccuFlow, operators would not be able to accurately apply NH3. Raven AccuFlow is a trademark of Raven Industries Incorporated. Raven AccuFlow™ and AccuFlow Vortex™ flow sensors enhance nutrient availability, and therefore maximize yield potential by allowing the flow meter and GreenStar™ rate controller to accurately meter anhydrous ammonia (NH3). This accuracy ensures producers’ crops get the nitrogen needed to reach the maximum yield potential. Many factors determine the yield producers will harvest each year. Most of these factors cannot be controlled, such as the amount of rainfall, temperature, and timeliness of rain. Crops such as corn and wheat require the correct amount of nitrogen to reach their maximum yield potential.